Embedded devices are increasingly connected to the Internet and called upon to communicate in meaningful ways with corporate IT servers. Allegro offers the Secure IoT Suite to aid your engineering team in building powerful connected embedded devices using industry standard communications protocols. Allegro offers technology specifically built for the embedded market to deliver HTTP server capabilities. Used in over 250 million devices, RomPager AE is the industry’s leading embedded Web Server in the market. Not far behind in distribution, RomWebClient AE provides powerful embedded HTTP client capabilities allowing your network-enabled M2M device to query remote servers for the latest information. TLS (Transport Layer Security) is used to create an authenticated and encrypted channel, often referred to as an encrypted tunnel, between two endpoints on an unsecured network. Allegro’s Secure Transport Layer toolkit (RomSTL) provides both Client and Server support for TLS in addition to DTLS capabilities. RomCert is a platform-independent implementation of the Online Certificate Status Protocol (OCSP) and the Simple Certificate Enrollment Protocol (SCEP) and makes embedding security certificate management into resource sensitive embedded systems and consumer electronics fast, easy and reliable while decreasing time to market. SSH provides encrypted communications between hosts over an insecure network. Allegro’s SSH embedded Client and Server (RomSShell AE) offers a range of client authentication options other than X.509 public-key certificates which require a fully functioning public key infrastructure. Leverage 10+ man years of XML product development in your embedded design with the use of Allegro’s field-proven RomXML AE toolkit. Allegro’s RomXML AE toolkit addresses the primary need for embedded XML support by efficiently translating between pre-defined C-language structures and XML-based representations. When used in conjunction with the RomWebClient AE your embedded device can initiate XML-based request/response protocols such as Simple Object Access Protocol (SOAP). Increasingly, device manufacturers are faced with building complex communications technologies into their products. Allegro’s RomXOAP AE is a field-proven product that enables your embedded device to efficiently communicate with corporate IT servers or other embedded devices utilizing a range of protocols and industry standard formats. Allegro’s Secure IoT Suite makes embedding standards-based security protocols into resource sensitive embedded systems and consumer electronics fast, easy and reliable. The Allegro Cryptography Engine (ACE) is a cryptographic library module specifically engineered to meet the critical needs of embedded computing systems in addition to fulfilling the requirements needed for FIPS 140-2 level 2 validation. The module provides embedded systems developers with a common software interface to enable bulk encryption and decryption, message digests, digital signature creation and validation, and key generation and exchange. Suite B is an advanced standard for cryptography that defines algorithms and strengths for encryption, hashing, calculating digital signatures, and key exchange. ACE includes a platform independent, government validated implementation of the NSA Suite B defined suite of cryptographic algorithms. The RomWebClient AE toolkit is a full-featured HTTP 1.0/1.1 Web client that retrieves and stores objects from any remote Web server using HTTP over IPv4 or IPv6. Objects can be in any format and are stored in memory or in an optional file system. The toolkit also supports caching, cookies, HTTP pipelining capabilities, and advanced HTTP streaming. RomSTL is a small, resource sensitive TLS client and server solution specifically engineered for embedded systems. RomSTL is pre-integrated with the full suite of RomPager AE products making it easy to envoke TLS as needed. RomSTL supports the latest RFC standards for TLS 1.0, TLS 1.1, and TLS 1.2 secure server and client sessions. The toolkit is hardware and software platform agnostic and written from the ground up for efficiency. The encryption protocols interoperate with any secure browser or server and include RSA, RC4, DES, 3DES, SHA, AES, and Suite B algorithms. RomCert is a platform-independent implementation of the Online Certificate Status Protocol (OCSP) and the Simple Certificate Enrollment Protocol (SCEP) and makes embedding security certificate management into resource sensitive embedded systems and consumer electronics fast, easy, and reliable while decreasing time to market. RomSShell AE is an embedded Secure Shell version 2 (SSH) toolkit. SSH provides encrypted communications between hosts over an insecure network. RomSShell AE offers a range of client authentication options in addition to X.509 public-key certificates. RomSShell AE can also be used for port forwarding (sometimes called SSH tunneling), allowing you to arbitrarily tunnel secure TCP connections. RomSShell AE also supports the latest RFCs for implementing Suite B with Secure Shell. The RomXML AE toolkit is a small eXtensible Markup Language (XML) implementation that enables your embedded device to send (frame) and receive (parse) XML documents. Using XML in your embedded designs provides for free-format interchange of data and is widely accepted in the device management, remote sensing, and enterprise IT communities. Allegro’s RomXML AE has been designed from the ground up for use in embedded devices that often have limited resources. Written in ANSI-C, the toolkit offers built-in capabilities to convert internal data between C language structures and XML documents. 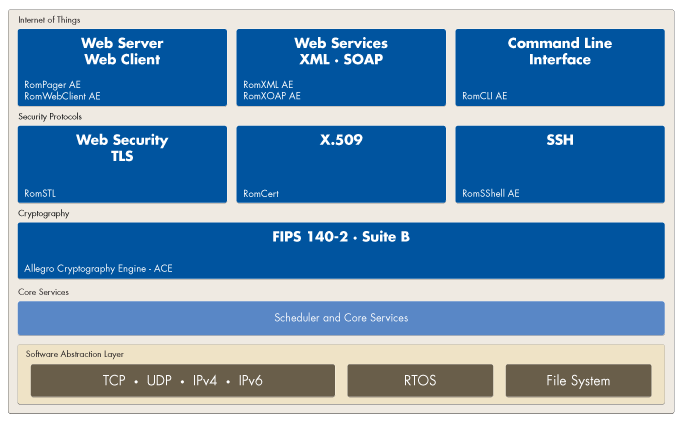 The RomXOAP AE toolkit builds upon the capabilities of RomXML AE and offers design engineers a comprehensive solution for creating connectivity between embedded designs and enterprise IT environments utilizing standards-based SOAP technology. Available as stand-alone toolkits or tightly integrated with the Secure IoT Suite, RomXML AE and RomXOAP AE provide the foundation for enabling embedded devices with XML, SOAP, XML-RPC, REST, and Web Services capabilities. The Allegro Cryptography Engine (ACE) is a cryptographic library module specifically engineered to meet the requirements needed for FIPS 140-2 level 2 validation. The module provides developers with a common software API to enable bulk encryption and decryption, message digests, digital signature creation and validation, and key generation and exchange. Suite B is an advanced standard for cryptography that defines algorithms and strengths for encryption, hashing, calculating digital signatures, and key exchange. ACE includes a platform independent, government validated implementation of the NSA Suite B defined suite of cryptographic algorithms.